There were estimated 15 people in front of me and 10 people behind me. Let's see whether the lemak was worth the queue. The original Royal Flush comes with the bagadil instead of the fried fish but it was sold out. First of all, the food looked amazing. 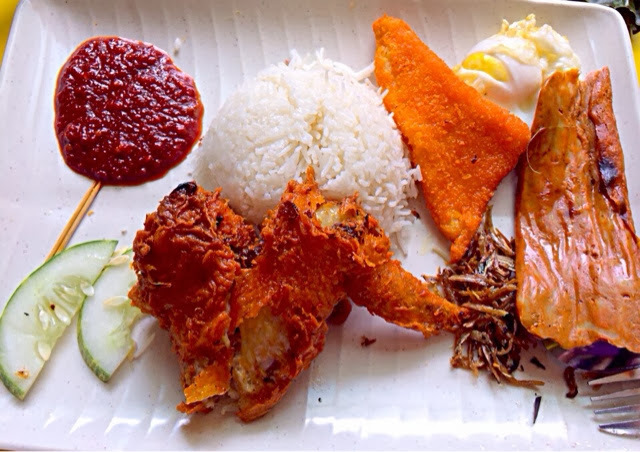 Some Nasi Lemak just looked ugly. Selera chicken wing was cooked golden brown. The crust was very crispy and not too hard. It was tasty. The meat itself did not have much seasoning. The rice had the nice aroma of coconut. The grains used were the long ones and I could make out each individual grain easily. If you are the type who enjoy the Malay mashed together lemak, you might not enjoy Selera texture. For me, it is just nice. The chilli was sweet and went well with the rice. The Otah was served lukewarm but it tasted great. The egg could be improved because I preferred the yolk to be softer but Selera egg yolk was thoroughly cooked. The ikan bilis were crispy. Overall, it was worth the queue. I would visit it again if I have a Nasi Lemak craving. There are two Lemak stores side by side each other. Selera Rasa is supposedly The Famous one. The long queue did add on to the excitement that good food was on the way. 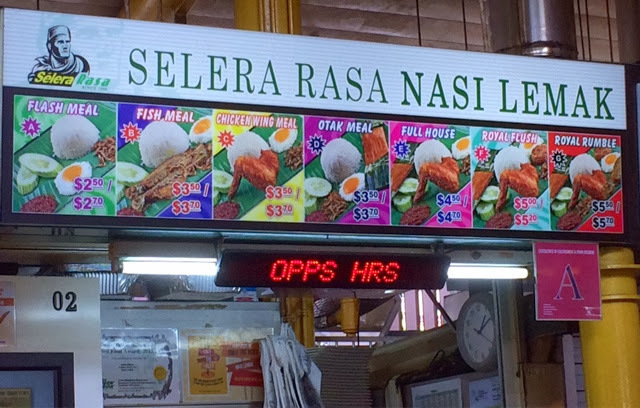 Selera Rasa has seven sets of Nasi Lemak for the customers to choose from. They did not allow me to add 1 extra chicken wing because there was a long queue. It was only 1pm but they had run out of Bagadil and fried fish. The Malay man in a bandana was polite and efficient. He would approach the first few customers to get their orders and inform them what had run out. The queue moved but slowly. If you had been to Tian Tian Chicken Rice at Maxwell, they had a very fast system of serving long queues of people. 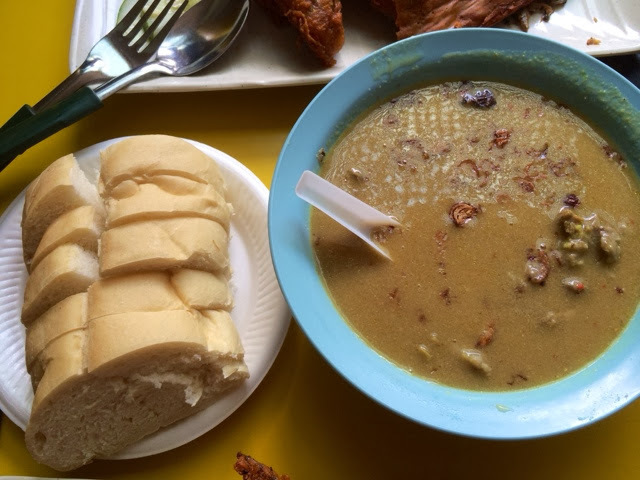 We also ordered mutton soup from the "I can't see clearly what's on the signboard" mutton soup store. The first taste was heavenly as the soup was piping hot and filled with the strong spice flavors. The mutton was shredded into small pieces instead of chucks. I was expecting chunks of succulent juicy mutton. The redeeming factor was that the mutton was soft and not smelly. Some mutton when not cooked correctly had a weird taste. The soup was thick. I preferred it to be thinner. Because it was thick, it did not taste very nice after it was cooled. 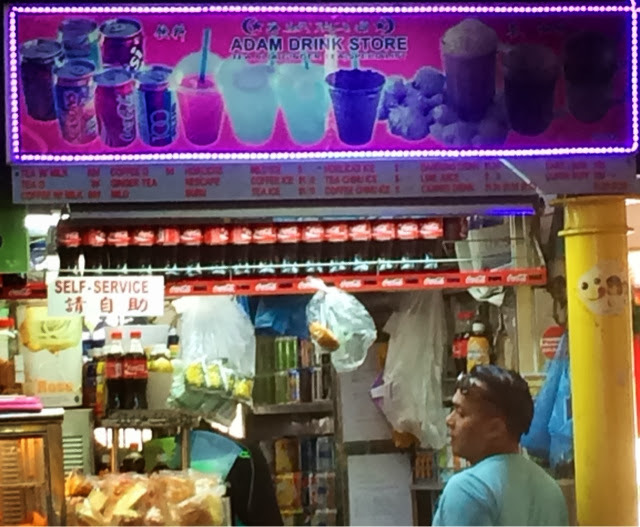 We ordered ice coffee and hot coffee from the very creative sounding name "Adam Drinks Store". The coffee was one of the best traditional coffee I had ever tasted. The coffee beans used was very fragrant and yet not bitter. Nice! Overall, it was a satisfying lunch at Adam Road Food Centre.